This document describes how to create and edit course section questions on an AEFIS course evaluation survey. These instructions are intended for AEFIS admins. If you would like to create AEFIS questions as an instructor, see AEFIS - Creating and Editing Questions (Instructor). You, as your department's Academic Contact, set aside a section for instructor questions on the course evaluation survey template. The course evaluation will not be released to students for at least 24 hours. Log into AEFIS with your NetID credentials. Select the Menu button (three stacked lines) on the left side of the page to open the AEFIS main menu. Select Course Sections from the left menu bar. Find the course section to which you would like to add questions. Select the Manage button to the right of the screen. You will be brought to your Course Sections page. Select Survey Questions from the left menu bar. 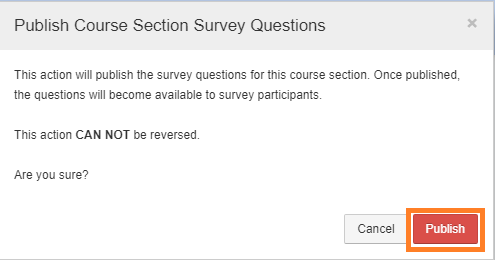 If you have not yet created any questions, you will see the No Course Section Survey Questions have been added message. Click the blue Let's Begin button. Select the blue Edit button on the upper right side of the page. 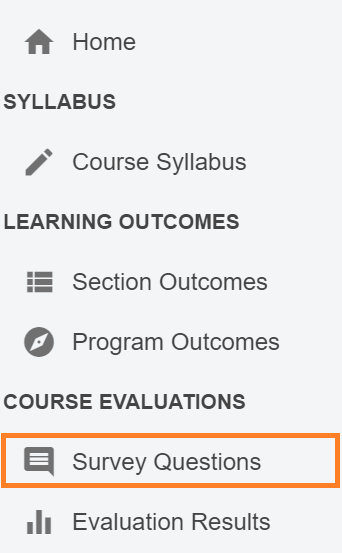 Click the blue + button to the right of your course section name. Select the type of question you would like to create from the left panel of the Add Question box. See AEFIS - Question Types, Settings, and Configurations (Admin and Instructor) for descriptions of each question type. 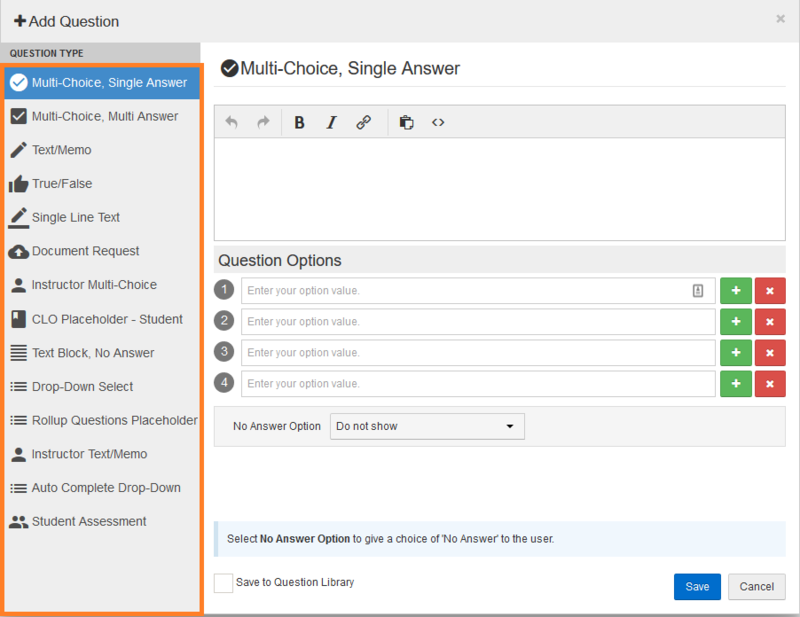 Add your question text and, for multiple choice questions, your designated responses. Use the blue Save button to save the question. You will see a list of the questions you have created so far on the course section question designer page. Click on the Question-[Number] button. Select Copy to make a make a copy of your question. A new dialog box will open with a copy of your question text and options. You can modify your question type, text, or options. Save your question. The copy will not be created unless you save. Select Edit to make a change your question type or content. Editing will reopen your question dialog box. You can modify your question type, text, or options. To make a question required or edit other configuration options, click the gear icon on the lower left corner of the question. Check the boxes next to your desired options. Click the blue check mark button to save. To find out more about configuration options, including recommendations, see Question Configuration Options. You must publish your questions at least one day before you survey is scheduled to go out. Questions that have not been published and questions that have been published after the deadline will not appear on your survey. 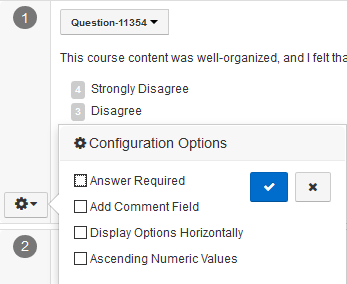 After you have added all of your questions, click the blue Exit button in the top right corner of the course section question designer page. You will see a warning that your questions aren't published. 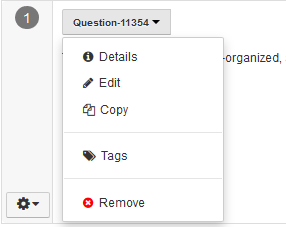 If you are done adding and editing questions, click the red Publish Questions button. You will be asked to confirm that you want to publish your questions. Note that once they have been published, you will not be able to edit your questions or to add any additional questions. Click Publish to continue. Once you have successfully published your questions, the warning message will be replaced by a notification that you have published your questions.